Anyone that spends any significant amount of their day online (and particularly on social media) will see new viral content and memes as they emerge from their embryonic state, but eventually many of them make it to the wider mainstream media. But how long does that process take? And where does it catch first? 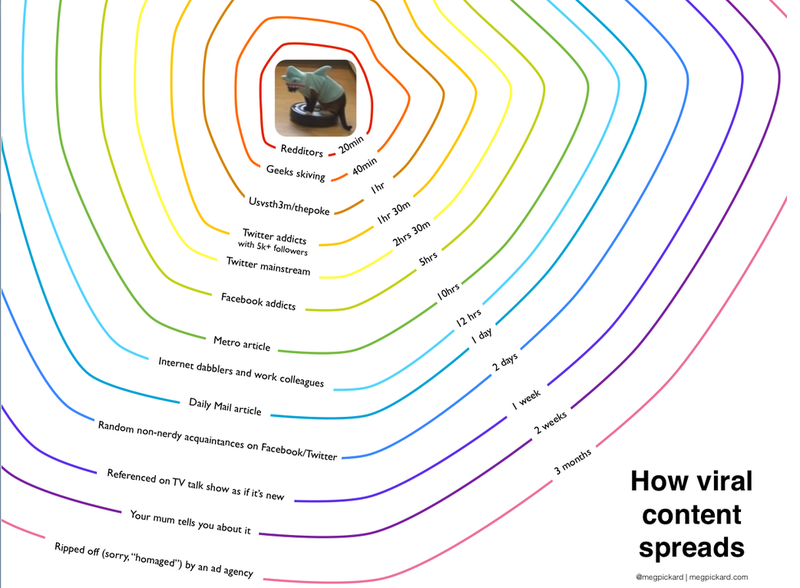 Well, Meg Pickard, former head of digital engagement at the Guardian has put together a tongue-in-cheek diagram to show exactly how quickly and where exactly it spreads. Shortly after posting the tweet, Pickard got in to a little bit of a Twitter scuffle over the provenance of the ideas (bearing, as it does, a close resemblance to this one, in French). Fear not, it all seemed to end amicably enough.